Andries Jonker becomes the first Bundesliga head coach to be sacked this season as VfL Wolfsburg replaces him with former Mainz boss Martin Schmidt. VfL Wolfsburg parted company with coach Andries Jonker on Monday, less than four months after he helped save the Bundesliga club from relegation, and named Martin Schmidt as his replacement. Jonker, appointed at the end of February, took charge of 19 competitive games, including the two-legged relegation playoff against Eintracht Braunschweig in May which Wolfsburg won 2-0 on aggregate to secure its top-flight status. Jonker's overall record was eight wins, four draws and seven defeats. The Wolves, beaten 0-1 by promoted VfB Stuttgart on Saturday, have made an indifferent start to the new season, lying 14th in the table with four points from as many games. The club said in a statement that the two parties had gone "separate ways" and that Jonker was "no longer head coach". "The decision to change coach so early in the season was not taken lightly," said general manager Tim Schumacher. "We were finally convinced by our internal advisers that we must undertake this task with a new coaching staff." Wolfgang Hotze, spokesman for the board of directors, said the decision was not just based on the Stuttgart match but "on the noticeable stagnation in the development of our... team in recent weeks". There was no immediate comment from the 54-year-old Jonker. Schmidt was previously in charge of Mainz 05 for 2-1/2 seasons. The 50-year-old Swiss left his post in May after Mainz escaped the relegation playoff on goal difference. "Schmidt is the right man for the task which lies ahead of us," said Schumacher. Schmidt, who signed until 2019, added: "I didn't have to think very much before taking this job. It was only a few hours from the first contact until the signature." Jonker, the first coaching casualty of the Bundesliga season, said after Saturday's game that his team played well in the first half but the forwards lost possession too often. Jonker's contract was due to run until the end of the season and he became the third coach to part company with Wolfsburg in less than one year following the sacking of Dieter Hecking last October and Valerien Israel in February. Jonker's entire backroom staff, including assistant coach and Arsenal legend Fredrik Ljungberg, have also been fired. Schmidt will take his first session on Monday evening ahead of Tuesday's Bundesliga match at home to Werder Bremen, which is followed by a tough away match at Bayern Munich on Friday. "We have two difficult games ahead of us this week, but we didn’t want to implement a caretaker solution, rather install a new head-coach with immediate effect," explained Wolfsburg's director of sport Olaf Rebbe. 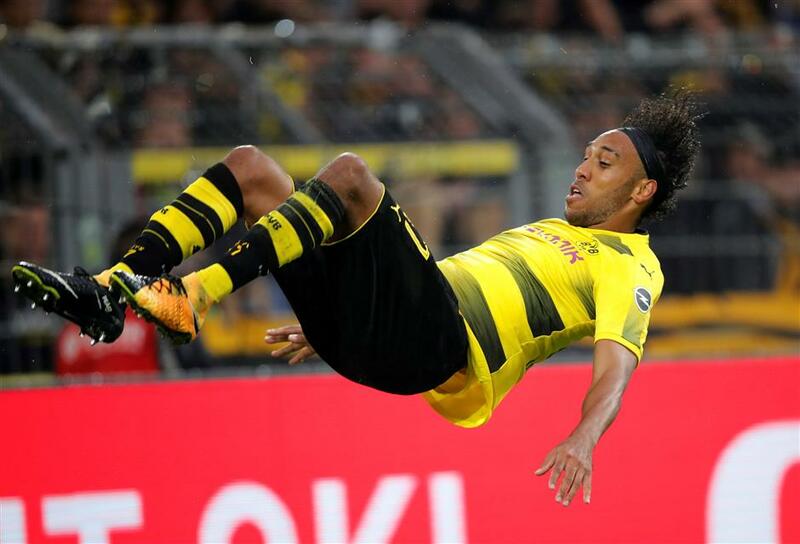 Borussia Dortmund’s Pierre-Emerick Aubameyang celebrates scoring the team's third goal against FC Cologne during their German Bundesliga match at Westfalenstadion in Dortmund on September 17, 2017. Dortmund won 5-0. Meanwhile, FC Cologne says it plans to protest to the German Football Association (DFB) on Monday over a controversial goal which has raised debate over the video assistant referee (VAR) in Germany's top flight. Cologne was crushed 0-5 at Bundesliga leader Borussia Dortmund on Sunday which left it bottom of the league after four straight defeats. But Cologne's bench was furious after Dortmund defender Sokratis Papastathopoulos scored just before the half-time break in controversial fashion to make it 2-0. In the build-up to the goal, Sokratis pushed Cologne defender Dominique Heintz, who knocked into goalkeeper Timo Horn, which caused him to fumble the ball from which Sokratis scored. The referee Patrick Ittrich allowed the goal to stand after consulting with the VAR. However, replays show the goal was scored after the ref had blown his whistle for the foul, which is against the rules. "We want a clarification of the legal situation," said Cologne's director Joerg Schmadtke after an internal meeting on Monday. "You can assume that we are protesting, because the rules were broken. "We cannot just pretend that nothing happened." Despite the heavy scoreline, Cologne sasy the controversial goal was a key factor in its defeat, but Dortmund's CEO Hans-Joachim Watzke accused the team of being "bad losers". "If they want to protest, they should, but that is grotesque, almost ridiculous," added Dortmund's director of sport Michael Zorc.